Palm Beach Jetty in Rockingham is only a few months old now, and is just as popular as the older, previous version. It was replaced only a short time ago because it was dangerous in winter storms and deemed unsafe. There was also a problem with vandalism to the jetty. Today however, there is a taller, longer and bigger jetty to fish off. It’s one of the most accessible fishing locations near Perth, and you can get some good fish too. The old jetty was built in 1944 to support the Navy. 3.6 million dollars later, it was demolished and a better jetty now stands in its place. It is 125 metres long and contains a memorial. 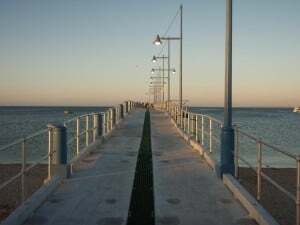 It is 40 metres longer than the old jetty, and has dual levels to provide some shade and different fishing locations. Even if you aren’t into fishing, it’s a great land mark to stop and take a peek at. Where is Palm Beach Jetty? 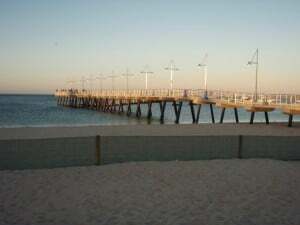 Palm Beach Jetty is located slightly west of the Rockingham Foreshore, on the Esplanade. To get there, you just follow the Kwinana Freeway south, and take the exit onto Thomas Road. Head West and then turn left onto Rockingham Road. This joins onto Patterson Road, which continues all the way to Rockingham Foreshore. Simply turn left at the end and follow the road until you get to a huge jetty. There is plenty of parking around the jetty itself, and if it’s really packed you can park in the side streets out of the way. Most fishing locations in the metro are not very good very often, because of how accessible they are to every man and his dog. This is usually why if you want to get some good fish you need a boat or you need to travel somewhere a little more remote. Palm Beach Jetty is usually quite good fishing (mainly because it is in Cockburn Sound), which is unusual for the Perth metro! Squid are abundant, as well as whiting, herring, tailor and various other species. Snapper, Mulloway and Skippy are also caught on the odd occasion. It is a very relaxing place to fish as well. The only problem if you fish off the top level is that you have to pull your fish a fair distance up, and it’s easy to lose them! 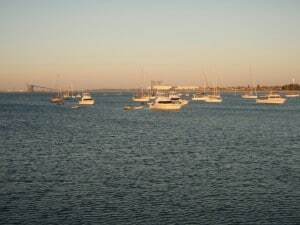 Places along the Rockingham Foreshore have long been a popular place to swim. Palm Beach Jetty is no exception. You are not allowed to dive off the jetty, but the lower platform provides a good, safe place for younger kids to swim and get back onto without much effort. Of course, watch out for those fishing because generally the two don’t mix so well! The jetty itself has been designed to allow elderly and disabled people full access. It’s only a few metres off the road, and is completely flat concrete. 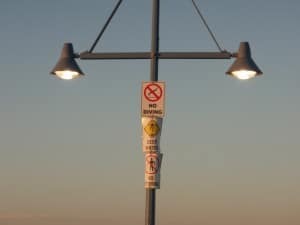 This means it’s safe to walk on for everyone. Shade has been created if you want it, but you just have to pick the right place to go on the jetty! Palm Beach Jetty is popular because it yields good results, and regardless of what time you go too. You can catch some great fish in the morning, afternoon and even in the middle of the night. 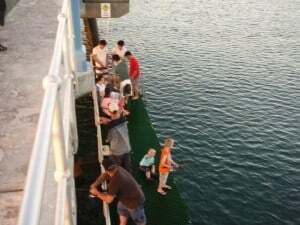 Be prepared for quite a few people fishing off the jetty at the same time, but if you are friendly enough then everyone gets along well. Just arrived on your website while searching on concrete and construction. It’s a horrible situation, this economy that we all seem to sink with it with. Anyhow, I just installed this new browser, Opera, Firefox, Mozzila, Safari and I have to figure a way to subscribe to your site here, but I recive some weird message when I hit the feed button. Any Ideas? Nope, it should work fine mate. I’ve just spun out, the photo you have of the people on the lower part of the jetty, is us, myself and my son and my daughter, I know I take heaps of photos of rocko, but I didn’t think I would come across my self. Haha – I get around! If you don’t want it there just let me know and I will remove it ;). Rockingham is a great place to take photos – I spend a lot of time there. thats cool Aaron, if u wanna share photos, you can submit photos on our site in the contact forms, we run a web site for Rockingham WA. I can even create an account for you on our Gallery site too, we are always on the hunt for text or photos about Rockingham. Ok, Sorry been so busy at work lately, I’ll create an account this weekend and let you know. My name is Duffy and I own h20rb. This is a small tourist business, allowing riders to walk on water by stepping into double skinned balls or rollers or the single skin zip-up zorbs! 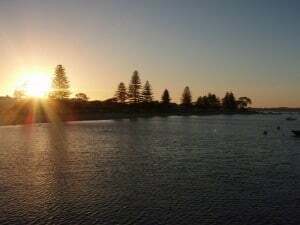 ( staying totally dry) we have our summer site at Rockingham Foreshore close to the gorgeous palm Beach Jetty. We will be available during the warmer months ( spending our ‘off season’ concentrating on parties in indoor venues.) our web-site is being formed but you can come visit us at our facebook site. Look I love what you’ve achieved here, it’s a lovely showcase of the area, when you next update anything on could you also consider including us. The council has encouraged tourism activities that were good clean fun and didn’t spoil the feel of the area. We met the brief and will be the local attraction at the beach. Thanks for visiting. It sounds like you have an interesting business – I will have to come and say hello next time I am down that way!